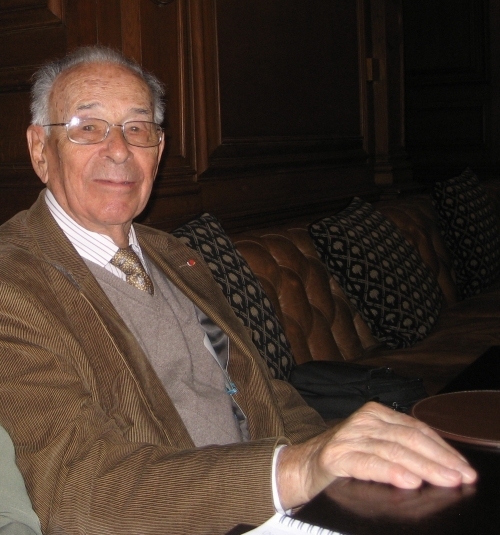 Jean-Louis Crémieux-Brilhac, Free French, eminent historian of the Free French and friend of SOE, died yesterday in Paris. 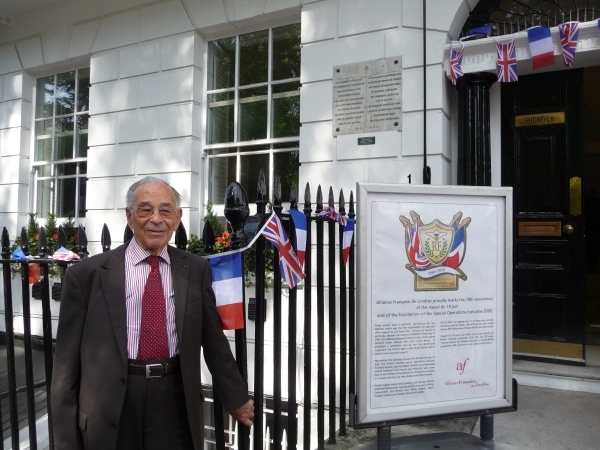 He was a friend of the Alliance Française de Londres and a dear visitor to 1 Dorset Square, during the war and more recently.We pay tribute to him. Born on 22 January 1917 near Paris, Jean-Louis Crémieux, as he then was, was studying history at the Sorbonne when WWII broke out. After training as a student Reserve Officer at the Saint-Cyr military academy, he was mobilised and became head of a section of the 47th infantry regiment during the Battle of France. He became a prisoner on 11 June 1940. Imprisoned in East Germany, he managed to escape from a Stalag on 4 January 1941 and crossed the Lithuanian frontier. He was arrested and incarcerated in several soviet prisons. When the USSR entered the war against Germany, he was able to embark for England from Arkhangelsk on 30 August 1941 with 186 companions, all of whom had escaped from Germany and been imprisoned in Russia. 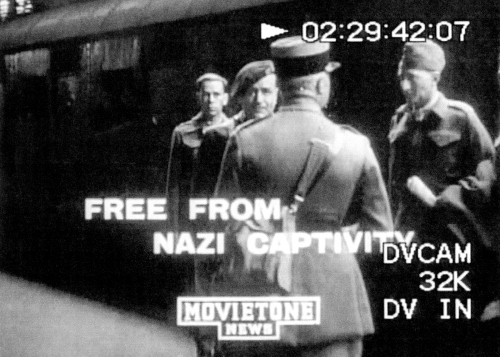 He arrived at Euston Station in London on 9 September 1941, a moment which is captured in the still photograph below taken from news footage. 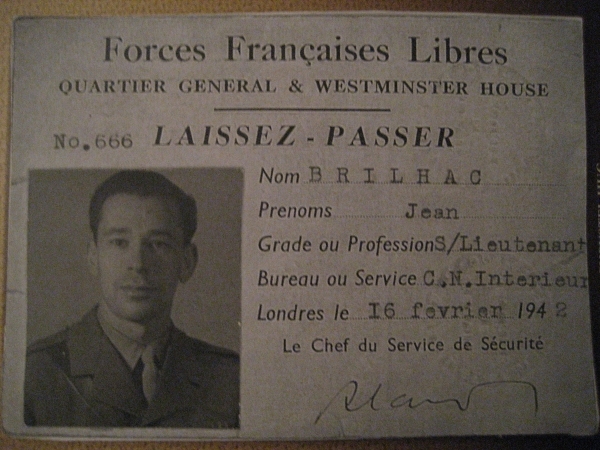 At the beginning of 1942, Lieutenant Brilhac joined the Commissariat National à l’Intérieur, in charge of collating political documentation about France. In the Spring of 1942 he was named secretary of the new Free French Executive Committee of Propaganda, and the following summer he became head of clandestine publishing for the Free French. This service created documentary dossiers, printed tracts and sent propaganda material to the resistance movement in France. During 1943 and 1944 he was liaison officer of the newly named Fighting French for the BBC, a role which he shared with Gilberte Brossolette, wife of Pierre, eminent visitor to our building. As part of this role, he spoke several times into the microphone of “Radio Londres”, for which he helped prepare programmes (notably drawing up the D-Day orders telling his countrymen how to react to the liberation of their country) until August 1944. Meanwhile he was giving talks to French Circles around the country, under the auspices of the Alliance Française de Londres. One of his topics was challengingly about “Sixteenth Century France and today: Paris under the Spanish Occupation”! 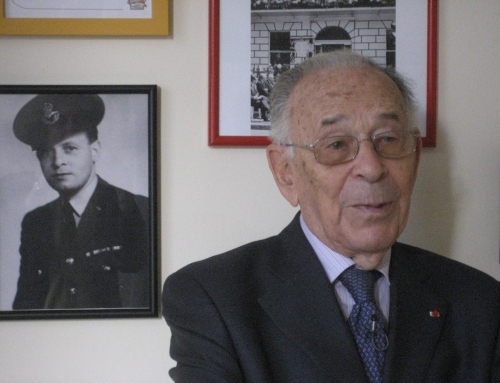 In a speech at the British Embassy in Paris in December 2008 Crémieux-Brilhac said, “je n’oublierai jamais la petite maison de SOE à Dorset Square qui était l’étape avant les départs pour le terrain d’aviation.” And it was an affable, elegant man, softly-spoken and with sparkling eyes, whom we welcomed back to 1 Dorset Square on 17 June 2010, the first of several recent visits. Crémieux-Brilhac has his place in the history of RF Section and 1 Dorset Square’s occupants and agents who passed through. It was in one of our classrooms that he collected his revolver and cyanide pill for a mission that in the end he did not have to undertake. He has many other claims to fame, and we honour them in one of our classrooms. His war-time visits to 1 Dorset Square are recounted in the forthcoming book `RF is for Real Friends'. After retirement from a career of haut-fonctionnaire, he took on research and his opus is La France Libre: De l’appel du 18 juin à la Libération, a book published by Gallimard in 1996 and awarded the Prix littéraire de la Résistance and the Prix Philippe Viannay. This book is the first, and to this day the only, complete work on de Gaulle’s movement, drawing from many archives which have remained unpublished. From then on Crémieux-Brilhac continued to represent the Free French at national events and contributed to the majority of publications on the subject. His real life experience and the remarkable rigour he gained as historian allowed him to shed a unique light on these extraordinary moments in contemporary French history. Moreover, ever since his wartime stay in London, he remained an active anglophile who did very much to make SOE known in France, particularly its role in the development of the Resistance. He notably promoted, and wrote the preface for, the recent and belated publication in French of the official history of SOE missions in France by M.R.D. Foot. A friend of SOE, a friend of the Alliance Française de Londres, we miss him greatly.